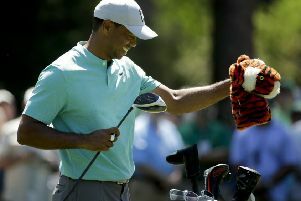 Tiger Woods hits his drive on the second hole during the first round of the Masters (Picture: David J Phillip/AP). England's Tyrrell Hatton plays from the trees on the opening hole during the first round of the Masters. The Ryder Cup player is one of nine Englishmen in the field (Picture: Charlie Riedel/AP). The operation was a last roll of the dice, but proved a success, Woods returning to competition in November that year and then playing a full season in 2018, culminating in his 80th PGA Tour victory in the Tour Championship in Atlanta. Woods had also contended for the last two majors of the year and carried on where he left off at Augusta, carding four birdies and two bogeys in an opening 70 to lie a shot off the clubhouse lead shared by playing partner Jon Rahm of Spain, former champion Adam Scot of Australia and South African debutant Justin Harding. “I thought I hit a lot of good shots and if I missed I missed in the correct spots and had some of the simpler up and downs because of that,” Woods said. Seeking a fifth Masters title but a first since 2005, Woods had quietly reached the 14th hole in two under par before a pulled tee shot set up a moment of magic from the former world No1 and 14-time major winner. This took the 43-year-old into a share of the lead, but he bogeyed the 17th and had to save par on the last after finding sand off the tee. Coincidentally, Woods shot 70 in the first round of each of his first three Masters victories and since sitting 33rd after an opening 74 in his 2005 triumph, the last 13 champions were all inside the top 10 after the opening round. This was bad news for Rory McIlroy, who needs to win the Masters to complete a career grand slam, but was outside the top 40 after an opening 73. McIlroy was two over par for the day after bogeys on the 10th and 11th, rallied superbly to birdie the 13th, 15th and 16th, only to drop shots on the last two holes. Denmark’s Lucas Bjerregaard enjoyed an impressive first round on his Masters debut, carding 70, which included five birdies, one bogey and a double bogey on the fourth, where his wayward tee shot hit a female spectator on the head.